Beautifully understated, with smooth milk chocolate fondant and shocking pink satin ribbon. 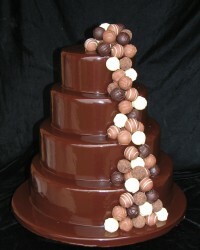 This design works well in any strong colour scheme, and also as chocolate with cream or ivory. Pictured with sugar cala lilies. 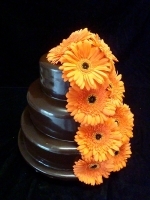 Price based on 4 tiers (to serve 200+) including sugar flowers. 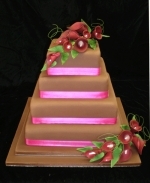 This cake makes a real statement on our “Cascade” stand. 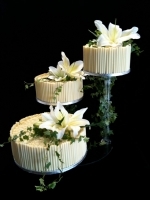 The cake can be in any of the styles, chocolate curls, the ganache as shown, or fondant, and is simply decorated with white Lilies and Ivy. A rich dark chocolate glaze provides a glossy backdrop for a cascade of truffles rolling down the side of your cake; the ultimate chocoholic’s dream! This is our signature cake and looks amazing “in the flesh”. The ultimate! 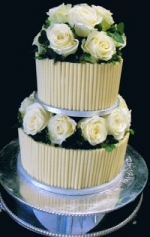 Almost 80 roses nestling between tiers of rich chocolate cake, covered in white chocolate curls. 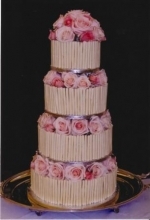 Several hundred Smarties were hidden under the roses, designed to pour out onto the tray as the cake was cut.